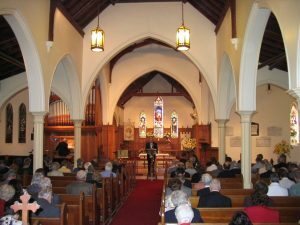 St Jude’s is an evangelical Anglican church. We offer a diverse range of service styles aimed to communicate the gospel of Jesus Christ and to strengthen and encourage its members in faith and service. 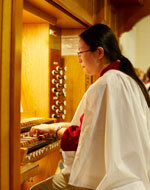 A traditional service style of hymns and Holy Communion. The service is taken from ‘An Australian Prayer Book’ and is held in our beautiful old church building. All are welcome to come and enjoy this beautiful service of hymns, prayer and Holy Communion. A contemporary service meeting in the new church building. This service is particularly suitable for families, but everyone is welcome. Taking place during the service is our special age related programs we have called K@CH (K-Yr 5) and Crux (Yr6-9). Our toddler and pre-school program is also available. There is more information for families with kids here. You are welcome to enjoy morning tea served after the service. A service of Morning Prayer alternating with Holy Communion in our traditional church building. Any children who attend this service are welcome to join in the children’s programs that run in the halls. Morning tea is offered after the service in the foyer area with the 9:30am service. LIVE is our Sunday night community, gathering at 5:30pm for great music, Bible teaching, prayer, food, and good times in our auditorium. Teenagers and young adults tend to gather at this service, but of course, everyone is welcome! Youth Group is for years 7-12 that meets each Friday night of the school term at St Jude’s. The cost is $5 and supper is included. A typical night at Livewire consists of some games, supper, a bible talk and discussion groups. We would love to have you join us, feel free to come along any time! Arvo club is for kids in years 5 & 6, we have Bible teaching, fun games and good snacks. Its a great transition group before kids come along to Youth group in Year 7. Arvo Club meets each Friday afternoon of the school term at St Jude’s. The cost is $3 and a light afternoon tea is included. Choral Evensong: These services are generally held at 3.00 p.m. on Sunday afternoons in March, June, September and December. A traditional Anglican service of Choral Evensong. Music is by the St Jude’s Singers, a four part choral group, and includes works such as the Magnificat and Nunc Dimittis, the Te Deum and the Preces and Responses. The December service takes the form of a special service for Advent. There are services conducted in a number of Retirement Villages and Nursing Homes in the district during the week. see the calendar for updated information about upcoming special services.